MICROWAVE DIRECTIONS: In 9-inch microwave-safe pie pan or round cake pan, microwave margarine on HIGH for 30 to 45 seconds or until margarine is melted. Stir in all remaining apple mixture ingredients. Cover; microwave on HIGH for 3 to 4 minutes or until apples are tender. In medium bowl, combine all pancake ingredients; blend well. Pour batter evenly over cooked apples. In small bowl, combine topping ingredients; sprinkle over batter. Microwave on HIGH for 3 to 5 minutes or until toothpick inserted 1 1/2 to 2 inches from edge comes out clean. Let stand 5 minutes on flat surface. Invert onto serving plate. Cut into wedges to serve. 1. CONVENTIONAL DIRECTIONS: Heat oven to 350°F. In 9-inch pie pan or round cake pan, melt margarine in oven. Stir in all remaining apple mixture ingredients. Bake at 350°F. for 10 minutes. 2. In medium bowl, combine all pancake ingredients; blend well. 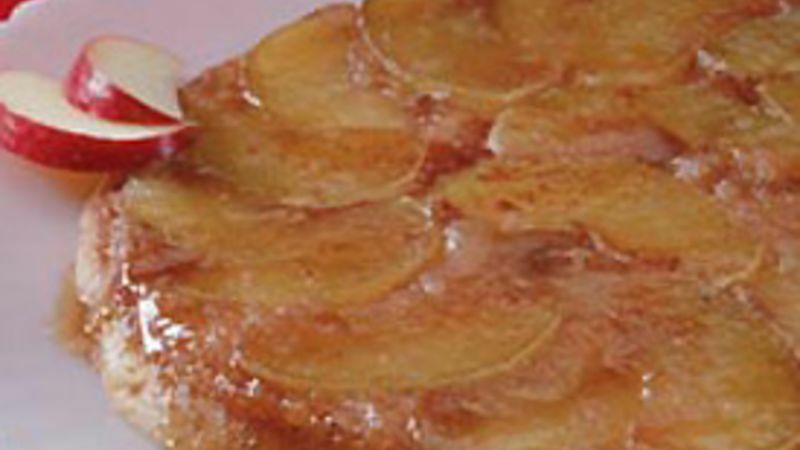 Pour batter evenly over cooked apples. In small bowl, combine topping ingredients; sprinkle over batter. 3. Bake at 350°F. for an additional 15 to 20 minutes or until toothpick inserted in center comes out clean. Let stand 2 minutes. Invert onto serving plate. Cut into wedges to serve. For a honey pecan version, sprinkle 1/4 cup chopped pecans over apple mixture in pan; drizzle with 1/4 cup honey before microwaving. Sprinkle with extra cinnamon and cloves, if desired.